Vibram Arctic Grip sole sticks to ice so you can walk without slipping. 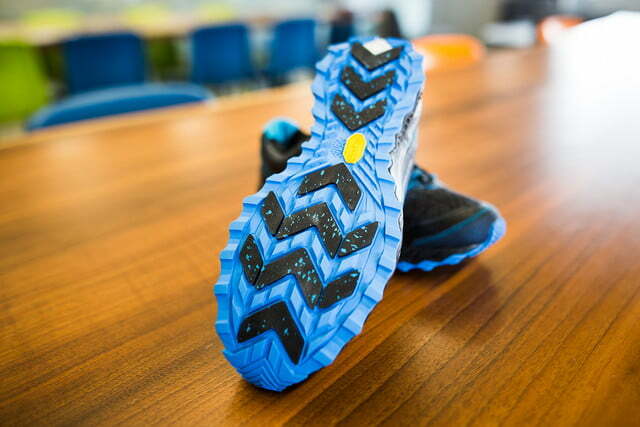 Vibram continues to transform the outdoor shoe market with its innovative sole materials. This year is no exception with the manufacturer debuting its Arctic Grip technology that is designed to give you traction in the worst conditions you encounter — wet ice. Earlier this year, the company showcased its Arctic Grip soles with an impressive public demonstration that allowed people to walk on a runway of sheer ice. 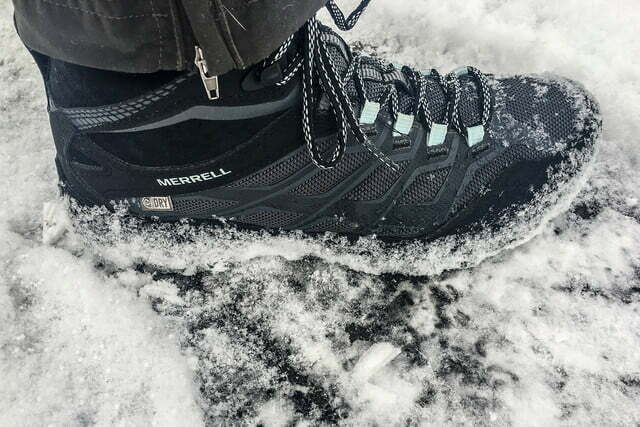 We got our hands on a pair of Arctic Grip boots made by Merrell and put them to the test to see if the sole material lived up to the hype. Vibram is no stranger to working with ice. The company is known for its existing Icetrek sole, which is designed for dry ice and similar cold weather terrain. The company’s new Arctic Grip sole is an entirely different beast. Arctic Grip works best on wet ice, allowing a user to walk on most icy surfaces without slipping. Arctic Grip looks like rubber, but it has a gritty feel that is reminiscent of pumice stone. Vibram has been working on the Arctic Grip compound for more than two years and is silent on what goes into manufacturing the material. All the company will confirm is that is a “unique polymer blend” that is “coupled with an advanced filler system and new processing technique.” Though they won’t spill the beans, we can glean some information just by carefully examining the material. 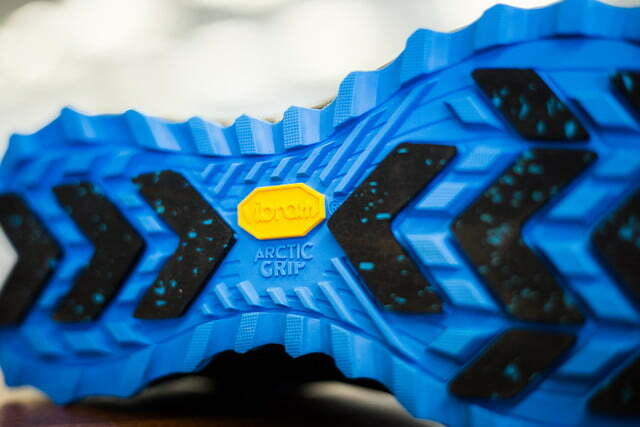 The first thing you notice about Arctic Grip is how it feels on the sole of the shoe or boot. It looks like rubber, but it has a gritty feel that is reminiscent of pumice stone. This grit likely is what gives the material its stickiness to wet ice and probably is the reason why the material has a slightly more limited mileage rating compared to other rubber compounds. 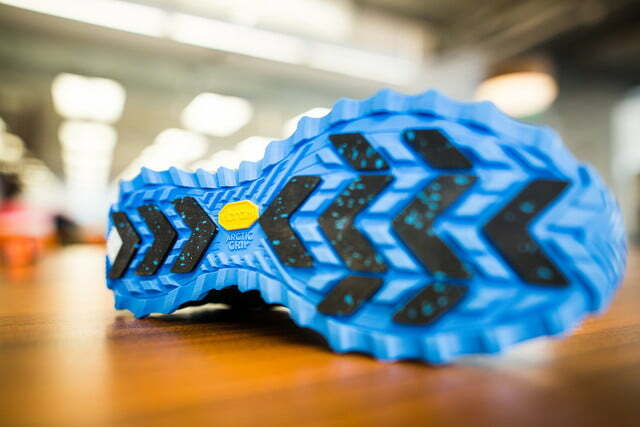 Vibram says that it has tested Arctic Grip up to 250 miles on hard surface conditions, such as pavement, without major performance compromise on wet ice. 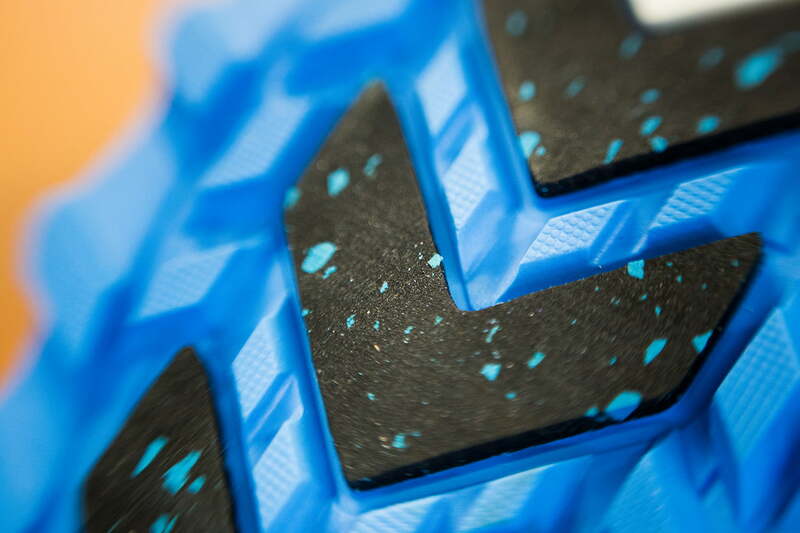 The Arctic Grip material also is colored with blue flecks that set it apart from the rest of the sole material. As a result, you can easily see where the Arctic Grip is located and can make sure you step on that part of the shoe when walking on ice. As a convenience feature, the Arctic Grip sole includes a thermochromatic lug that changes colors from white to blue when ice conditions are present. This color change is a helpful reminder to walk more cautiously. I just wish it was in a more visible location such as the top or the side of the boot. Which shoes have Arctic Grip? Vibram Arctic Grip is making its retail debut on 2016 model shoes and boots made by Wolverine Worldwide, which owns brands like Merrell, Saucony, Sperry and more. The products range from high-end hiking boots by Merrell to a pair of casual Hush Puppies shoes. Starting in winter 2017-2018, Arctic Grip will be available on shoes from other partner shoe manufacturers. No Arctic Grip shoe are the same, though, as the material is integrated into the sole according to each manufacturer’s specifications. “The design of each sole is always unique as Vibram works with the partner brands to design and develop the best product for the intended environment,” Chris Favreau, VP Innovation and Operations at Vibram, told Digital Trends. As for why the entire bottom isn’t made of Arctic Grip, shoe manufacturers have the option to integrate Vibram’s Icetrek material that is designed to be effective on dry ice. A combination of both materials would ensure enhanced grip in all icy conditions. We were able to test out a pair of Merrell Moab Fst Ice+ Thermo Winter Hiking Boots in the beginning of this cold New England winter. On these boots, the Vibram Arctic Grip is applied to the 5mm lugs of the sole and is spread throughout the toe and heel portion. We took these shoes on several strolls in our driveway and up a rugged hike to the Lake of the Clouds hut at the base of Mount Washington. We tested the Merrell boots both on a paved driveway and found that the Arctic Grip-enabled sole provided superior traction when compared with standard rubber treads. When walking on the slippery hard-packed ice and snow in a driveway, the Arctic Grip provided excellent traction, allowing us to walk with a normal gait instead of a cautious shuffle. It was liberating to walk from the front steps to the mailbox without worrying about falling flat on our back. Traction in the deeper snow (2″-4″) also was good, but that may have been the combination of the deep lugs with the Arctic Grip. This superior traction in snow may be not as pronounced on shoes with a more mellow tread. Though it is significantly better than other rubber soles, the Arctic Grip technology was not flawless, and we were able to make the boots slip on ice. This slipping occurred most frequently when the boot was covered with sticky snow and ice that filled the lugs and covered the Arctic Grip surface. Because the Arctic Grip lugs were covered by the snow, it was unable to work its magic on the ice, and we had difficulty walking without slipping. This slipping occurred when conditions were wet and did not occur in colder temperatures when the snow was more fluffy, and the ice was more exposed. On the trail, the Arctic Grip performed beyond expectation on the ice-covered rocks allowing us to hike most of the trail without microspikes, snowshoes or any other form of traction. Members of the hiking group were surprised by the boot’s performance — while they had been in spikes for almost a mile, we were still bare booting without slipping. The only time we needed additional traction beyond the Arctic Grip was when we reached the deeper snow (6”-8″). Similar to our experience in the driveway, we found that the Arctic Grip was much less effective when the boot’s lugs were packed with wet snow. 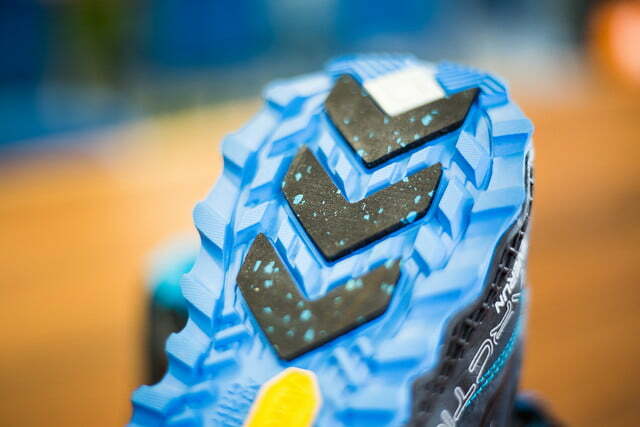 Vibram’s Arctic Grip material is expected to last at least 250 miles under normal walking conditions. Specific shoe warranties will vary based on the manufacturer and the model of shoe or boot that is purchased. Vibram Arctic Grip surprised even the most seasoned outdoors enthusiasts with its ability to grip the ice where other boots slip. The newly developed sole material is a game changer for those who frequently navigate over slick conditions on foot. Arctic Grip is unrivaled in its ability to stick to ice. There is no other sole material on the market that can deliver the same traction on ice. The best alternative to Arctic Grip is not another sole material, but ice cleats that fit over a boot. Vibram says that it has tested Arctic Grip up to 250 miles on hard surface conditions, such as pavement, without major performance compromise on wet ice. Once the Arctic Grip wears off, the boots and shoes will still be wearable, but they will lose their excellent wet ice traction. At this current moment, there is no way to re-apply the Arctic Grip material. When the lugs wear off, owners will need to purchase a new pair of shoes. Do buy Arctic Grip soles if you want to walk comfortably and confidently on ice, but don’t want to wear ice cleats or another type of traction. Don’t buy Arctic Grip if you absolutely need 100 percent traction all the time. It also doesn’t work well when wet snow or slushy ice builds up and sticks to the bottom of the boot. In these case, you’d be better off with a good pair of ice cleats.